Swiss watchmaker MRC (Manufacture Rodolphe Cattin) presents new limited edition watch Tempovision Square Tourbillon, which are part of a collection of MRC Gent. The model was released back in 2012 and was officially presented at the international watch fair BaselWorld-2012. The watch case is square, curved, made of stainless steel or 18-carat rose or white gold. Black dial, on which there is no time indices or arrows with 4 disk pointers. Pointer, located at label 10 is intended to indicate the hours, another pointer to a tag is used to display two minutes, and the pointer at 5 o’clock – to indicate the seconds. Fourth disc located at 7 marks – reserve indicator. Protects the dial curved sapphire crystal with anti-reflective coating. Tempovision Square Tourbillon model is built on the basis of the Swiss caliber MRC900 (base caliber Concepto) with a frequency of 21,600 polukoelbany hour, 72-hour power reserve. 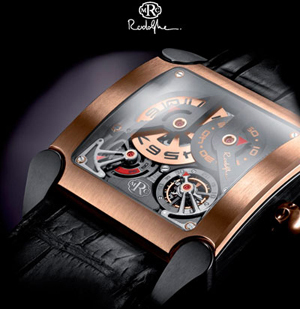 Sapphire set on the back of the watch, you can monitor the work of the minute tourbillon. The model comes on a leather strap. Release hours Tempovision Square Tourbillon from MRC is limited to 10 copies.